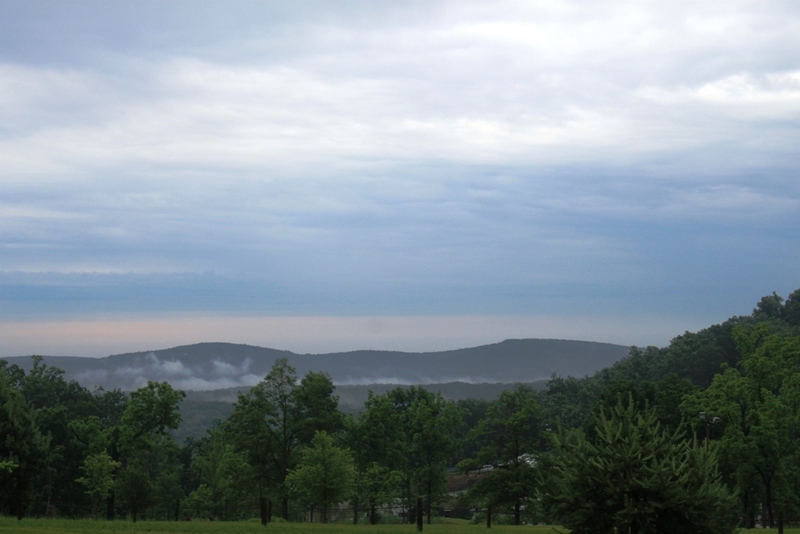 Right now the weather pattern over Roundtop Mountain is one where the mud never truly disappears. It rains heavily, often with thunderstorms. Then it clears for a day or two and the rain returns again. So far even this pattern hasn’t entirely erased the precipitation deficit caused by a lack of snow and a lack of April showers. But the gap is, at least, diminishing. I’m tired of the mud, though. The rain makes the deck and the stairs slippery, even with that sandpaper tape. The tape works well enough but doesn’t stay on for long. And I can’t add more to the steps as long as they never dry out. I’ve slipped and fallen on those steps more in the last 10 days than I have in the last year or two. I’m still nursing bruises. The Wellies that I wear to avoid the mud probably don’t help either. What I need are Wellies with ice crampons. Even Dog slipped the other night. 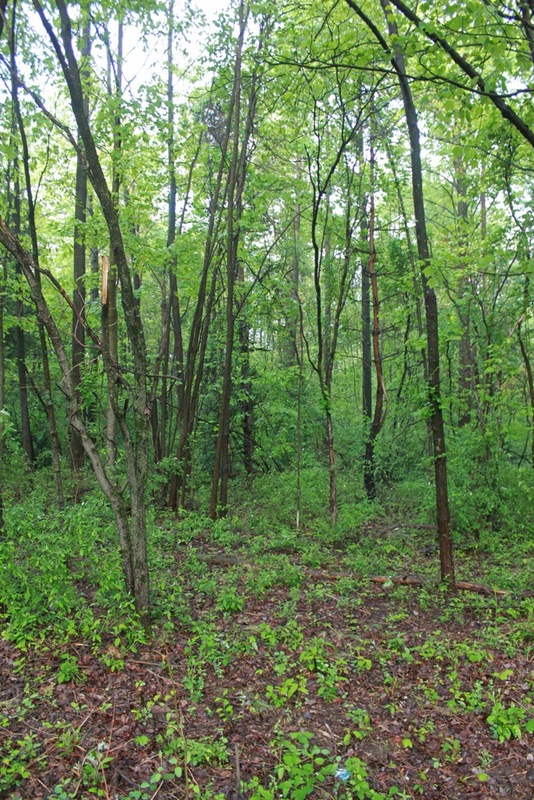 The rain is making the woods grow like crazy. I’m at the point where I’ll have to trim back the new shoots trying to find room to grow into my driveway. The sides of my car are scrapped by leaves and twigs every time I head in or out from the cabin. This is a chore I’m forced to do at least once a year. When I’m done I’ll think I have trimmed everything too much and needn’t have worked so hard. But within a year and maybe even by fall I’ll have to do it again. True, it’s not as bad as mowing grass would be, but twice a year seems like a lot to me. It’s not just grass that grows fast in this weather. Everything else does too. Last evening produced quite the gullywasher, though nothing worse at my cabin. No trees down, no power outage, no hail. I was luckier than some areas not far away. The thunder and lightning was still bad enough to scare the chicks, the kittens and the dogs. That makes for a rocky evening, one where little is accomplished and a walk is out of the question. After the downpours, the remnants of the storm hung around, producing rain off and on for much of the night. 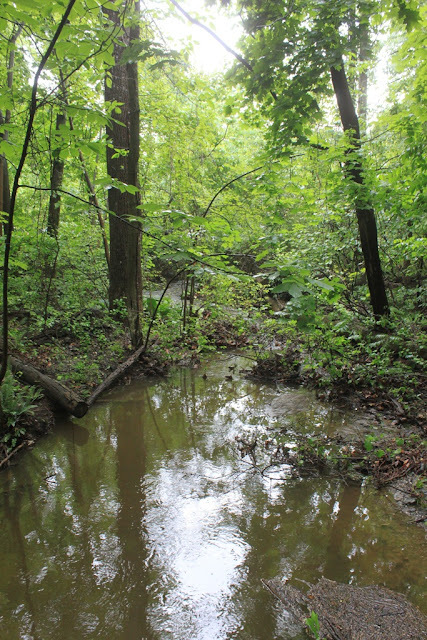 The morning is muddy and the local creeks and washes are all running full. I’m just happy the storm is over and cooler, less humid weather is ahead. I turn into a slug during hot and humid weather. Even reading seems like too much effort, let alone cooking or washing dishes or wandering the woods. At this point in the season the woods are as lush as they are going to get, and the rain makes the forest look even more lush. Trying to walk through woods this thick is a bit like trying to walk through a jungle, and it’s not enormously fun. Brambles, deer ticks, wet leaves don’t make for an easy time of it. I pulled a deer tick off my wrist yesterday after my morning walk with Dog, and we stayed on dirt roads for our walk. Those ticks are so tiny they are no bigger than the period at the end of this sentence. I thought I had a piece of dirt on me, went to brush it off and only after it wouldn’t brush off did I realize that it was a tick. In summer I tend to stick to existing trails where the underbrush is chopped back. Bushwhacking is better left to the winter months or at least the fall when the remaining underbrush is dry and easier to navigate. The ticks are fewer then too. 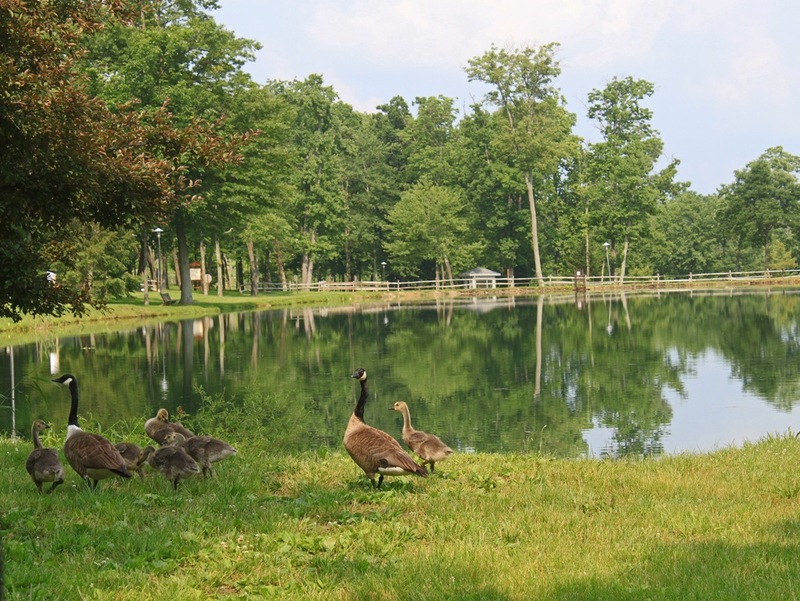 Although Memorial Day is only the unofficial start of summer, the local goslings are the size of chickens already. One of the three local families was on parade yesterday afternoon, and I couldn’t resist snapping a shot of them. All told 27 geese and goslings spend most of their days on this little pond. The total breaks down to 6 parents, 2 “helpers” that are probably last year’s babies and 19 goslings. This group are the biggest and are likely a week or so older than the other two groups, which appear to me to be identical in size. Even this group doesn’t have any feathers yet, though. This holiday weekend here was a hot one, and I hope it doesn’t mean the rest of the summer will be as hot. Worse than the heat was the oppressive humidity. Sunday was the worst day for that. Monday was likely even a degree or so warmer than Sunday but felt better as the humidity was slightly lower. Today, severe storms are predicted to clear out this unseasonably warm weather and return the mountain to normal temperatures again. I’m ready for the normal temperatures, but I’m not a fan of severe weather in any form. After living in the woods as long as I have, you might guess I’d be used to severe weather, but I’m not. Wind is my most common bane. Surrounded by trees as I am, wind is an almost ever-present danger that can wreak havoc in any season. Lightning ranks #2 on my list of scary weather. I’ve had some lightning strike so close to the cabin that the flash momentarily blinded me. And the strike was still a good 100 feet away. Secondarily, even not-terribly-close strikes knock out electricity and can cause other damage. My neighbor’s well pump was once knocked out by a nearby strike—though mine was fine that time around. So extreme weather of one kind or another is always a concern. I don’t let the threat or even the reality of bad weather keep me from living in the woods, but I’m always glad when it’s over, too. Is it just me (or just here) but don’t the leaves on the trees already have that deep green shade of midsummer to them? Early spring leaves are a bright, almost a neon green. Midsummer leaves are a deep emerald, and by September, the leaves are taking on a duller, brownish green. By late September, the leaves look more than a little rough around the edges. So here it is late May, and the leaves already have that July shade of green to them. So what’s that going to mean? That August brings the brownish green? And if so, what does that mean for September? I probably won’t know the answer to that one until September, but it does make me wonder. 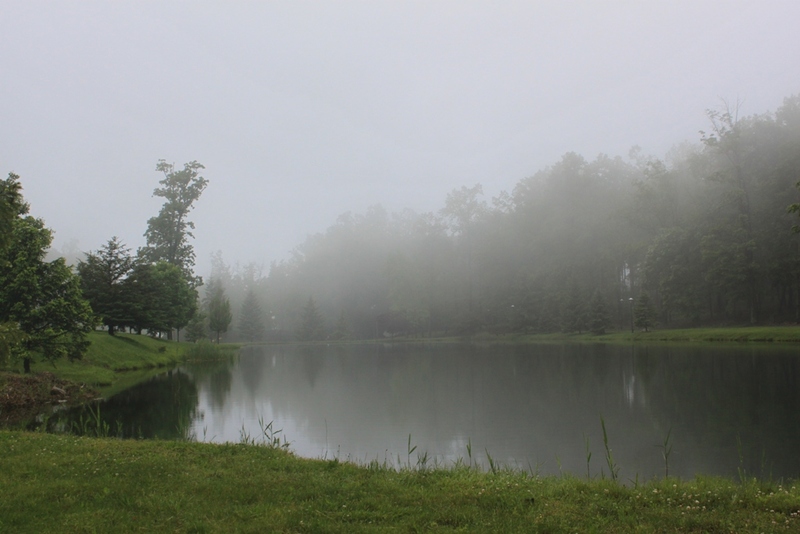 This morning the mountain was so foggy that even at 7:30 a.m. my camera wanted to use the flash on everything. 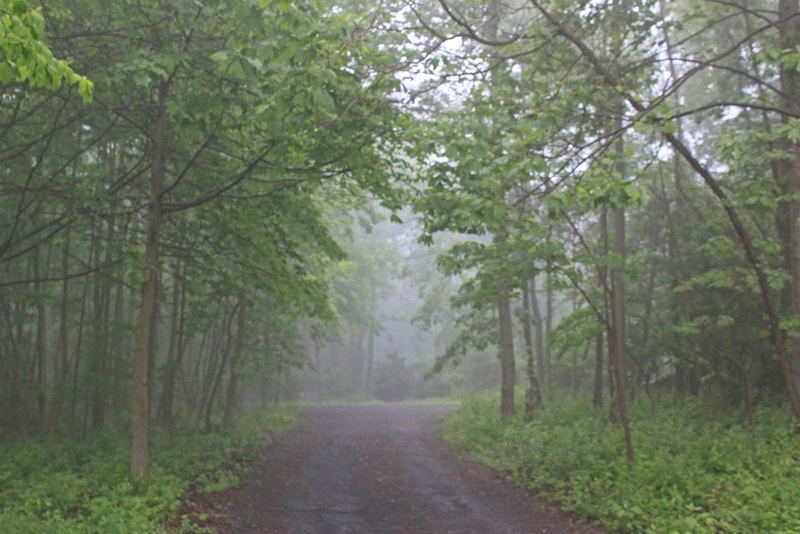 The fog improved later in the morning, but the day is still a “soupy” one. The upcoming weekend promises to bring the first almost-heat wave of the season. In this area a heat wave is officially three days in a row where the temperature is 90 degrees or above. We won’t get that, fortunately. But the temperature will be at 90 for at least one day and near 90 for at least two more days. Close enough, and more than hot enough for May. I’m just not ready for that. Of course, being a winter person, I’m pretty much never ready for the heat of summer, especially when it looks as though it will last for four months. Last evening I found a nice, good-sized black snake along the edge of the lane near the cabin. I was taking Baby Dog for her evening walk, and the snake was perfectly still. I moved closer to it to make sure it was okay and to get a sense of how big it was. It was close to four feet long, though not one of those really wide black snakes. I tried to get Baby Dog to look at it, but every time I said “Look!” her head went up. She was looking alright but not at the snake. Then a squirrel ran down a tree, and she was sure that’s what I wanted her to look at. I moved a little closer. The snake still didn’t move, so I took a twig and touched it gently, figuring that would gets its attention. It did. The snake started to coil up, trying to make itself look fierce. It even vibrated its tail, as though it was a rattlesnake. This would have been a lot more effective if the tail had been vibrating on dry leaves. It wasn’t particularly effective in grass. Baby Dog’s toes were now only about a foot from the snake’s tail, and she was still looking at that squirrel, so I gave up trying to get her to see the snake right in front of her. Maybe she just didn’t care about the snake, as squirrels are far more exciting since they run around and leap into trees and chitter annoyingly at her. Maybe she just can’t be bothered with snakes that are low to the ground and slow. Baby Dog just doesn't do snakes. 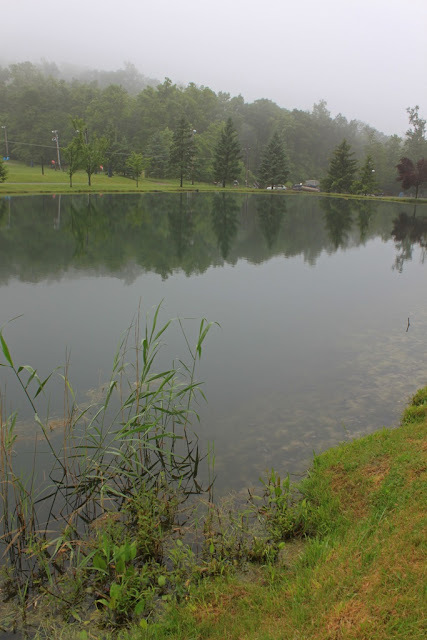 The word for my weekend should be “procrastination.” That would explain, perhaps, why I waited until a gloomy and rainy Monday morning to take a photo for today’s Roundtop Ruminations. The weather this weekend was glorious, and I did look for something to strike my eye. Perhaps it was just that perfect, crystal clear light. Perhaps that glorious lighting was simply too harsh, but for some reason, nothing struck my eye. If I am truthful, I can say that it wasn’t just photography that suffered this weekend. The ironing didn’t get done either, and my baking plans never materialized. Procrastination was the word, or perhaps simple laziness, though procrastination sounds less harsh than laziness. I suppose one word is as good as the other, because for whatever reason, this weekend it didn’t get done. All of which explains why I was standing in the rain this morning with my camera in hand. So there I was, looking for flowers that weren’t yet in bloom, or a fern I hadn’t yet photographed. Moths and butterflies were all hiding from the drops. This morning sound struck me more than anything visual. The sound of rain on a million or a billion leaves (I’ve never tried to count). The sound of a breeze through the leaves, competing with the sound of the rain falling on the leaves. Where did one end and the other begin? It was hard to tell. The rattling breeze sounded very like rain dropping onto the leaves. And both traveled through the forest. Sometimes I could hear it coming, sound rolling up the mountain, growing louder and louder until the breeze or the rain reached my shoulders. Or not. Sometimes the breeze traveled to one side of me. Sometimes the rain fell on this tree and not that one. When I can hear it like that, either the rain or the breeze, it’s almost like seeing it. The route is traced by the sound of it on the leaves. It’s not all or nothing. It’s not an even sheet of rain or breeze that gobbles up everything in its wake. It’s this tree, not that one, a thin path through this part of the forest, but not over there. The sounds move through the forest. One tree sways in the breeze, while its neighbor is untouched. I can hear how the rain moves through the forest, up the hill, the sound growing louder as it nears where I stand. Sometimes it’s not a sight that moves me but the sounds. Why is this a weed? Now that the drama of the fox kit and the heavy rains is over, I am returning to paying more attention to what’s going on in the woods around my cabin. In just a few days, the once glorious in non-native dame’s rocket is already starting to fade. Summer wildflowers are not yet in bloom, though a few of the summer-long bloomers are starting to appear. Today’s photo is Philadelphia fleabane, which is just a fancier and more alliterative common name for common fleabane. 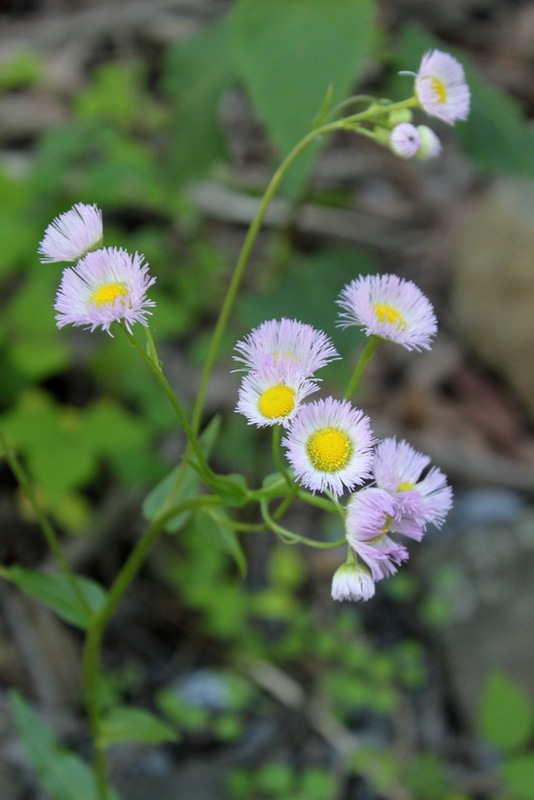 Philadelphia fleabane is told from the equally common daisy fleabane by the pink flowers. Daisy fleabane boasts white flowers but other than the shade difference the two pretty much look the same. Why we humans value flowers that require constant attention and work over those that take care of themselves is a mystery to me. I have enough work to do, and when flowers appear without my having to do anything to encourage them, I’m thrilled. More beauty and less work suits me just fine. After the rain ended here, I wanted to go check on the little red fox kit that I’d found (well, Dog found it) in a barrel along one of the ski slopes on Roundtop. 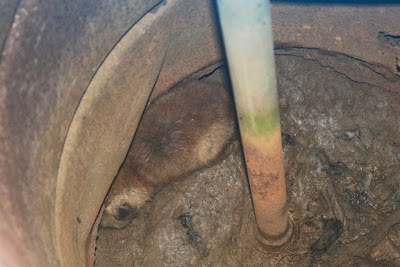 The little fox was too small to get in and out of the barrel—the slippery metal sides to the barrel didn’t help either. Momma fox hadn’t chosen her den very well. The day before I’d dropped in some straw that was originally intended for my chickens. I was worried that the little fox couldn’t get out of that barrel, and I was worried that the barrel would fill up with water from the rain. So, I headed up the small ski slope towards the barrel. I hadn’t gotten very far, not even halfway there, when suddenly the little fox bounced out from tall grass beside a rock next to the slope. It wasn’t 15 feet away, and I’d scared it by walking by. Success! That meant the straw in the barrel had allowed it get out of that soggy mess. I stopped and the little fox trotted away from me. I watched it go. It trotted toward its barrel for a short distance and then had to stop to scratch an ear. After that was accomplished, it continued onward toward the barrel, this time at a walk, having to stop again before long to give shake itself off. Like kittens and puppies, fox kits don’t focus very well. I was well-pleased with myself. I’d managed to help the little fox without really interfering with it. Now at least it has a chance to grow up. I’ll be even happier if it stays away from my chickens. Late yesterday afternoon a few hard rain showers moved across the mountain, and I got to thinking about the fox kit in the barrel, worrying that the barrel would fill up with water and drown it. So when I got home I went to check on it. It was still there, and the bottom of the barrel hadn’t filled with water, though it was a bit muddy. I decided I would toss some straw from the bale I keep in the back of my car (having no better place to store it) into the barrel. I keep the straw for the chicken pen and add it at little bit at time to their digs. I grabbed an armful of straw and tossed it down there and headed back to the car. Once there, it occurred to me that if I added another armful of straw the little fox might be able to climb on top of the straw and get out of the barrel, if it wanted to, and if nothing else the straw should keep it dry during this rain. When I got back to the barrel, the little fox was already climbing into the first armful of straw. It looked like it was trying to dry off or get out of the mud.. I added the second armful of straw and left. The straw now comes up to within perhaps 10 inches from the top of the barrel. I think the little fox would be able to climb out of the barrel if it got atop the straw. This morning I checked on the little fox again, but overnight the straw had been rearranged so that I could no longer see the bottom of the barrel. The straw now covered the entire barrel opening instead of being heaped onto one side as I’d left it. I couldn’t see if the little fox was still in there or not. Either way, tossing it an armful of straw was about all I could do for it. This weekend was the time for some of the new mountain babies to appear, or at least for me to find them. 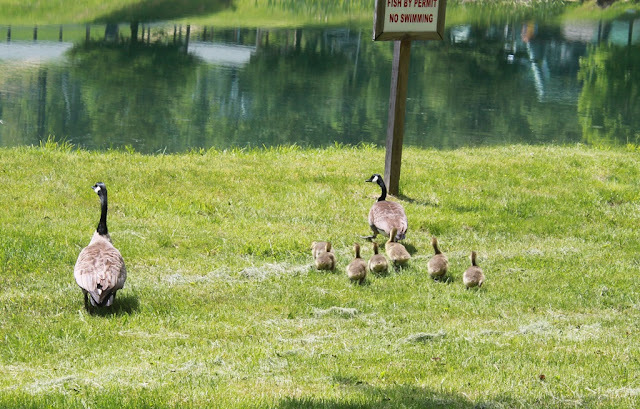 First, the goose babies: Each time I left the mountain this week I saw the Canada goslings. Once I saw six, the next time I saw seven and thought I’d missed seeing one, and then I saw six again and wondered if one had perished. Wrong on both counts. On Sunday I saw two sets of parents, one with six babies and the other with seven babies. It was only when I saw them strolling side by side that I realized there are actually a total of 13 babies in two separate families. The second baby is a not a good photo, because the baby is scared to death. The poor thing has its head as hidden as it can make it, so all you can see is its tiny, furry little body. Have you guessed what it is? It’s a red fox kit who has a very stupid vixen for a mother. Why is the mother stupid? Because of where she has chosen the den for this baby. But I’m getting a bit ahead of my story so let’s go back to the beginning. This morning as I was walking Dog, I kept hearing the foxes bark. One was obviously nearby, the other somewhat further away. I was worried that the pair was getting ready to make an assault on my chickens. So I decided to walk Dog towards the closer of the barkers, thinking to scare it away, and thus hopefully distracting it from an attack on the chickens. Following the sound took me out along the edge of the smallest ski slope. The barking was originating from perhaps halfway up the slope, and it was quite persistent and frequent. And then Dog got interested in something nearby. First, a little more background to this story. Roundtop places 55-gallon drums with the bottoms cut out around the water pipes that bring water up the mountain for snowmaking. In winter, they attach what looks like small airplane motors on wheels and that have a trailing rubber hose to each water connections. In non-skiing months, the airplane motors on wheels are stored elsewhere but the barrels remain, probably because it’s easier not to move them but also because it keeps those who mow the slopes from running over the water lines. Typically, there’s a metal barrel underground that’s buried up to the rim and a blue plastic barrel atop the metal one that’s above the ground. Well, momma fox managed to move the blue plastic barrel just enough so that she can jump down in there, and that’s her den for this little fox kit. The site is dangerous for the kit for several reasons, not the least of which is that it’s raining today and I would expect water to collect down there. For another, although momma fox can get in and out of her den, I doubt baby fox is yet big enough to jump out, so it can’t escape from the den if it needs to. The baby is fairly good-sized, though, so I’m not sure momma fox can carry it out of there, either. When my dad was a teenager he had a fox as a pet, and though I was momentarily tempted by that thought, I let this baby where it was. I might check the spot again tonight just to make sure it’s not filling up with water. If need be, perhaps I could put something down in there to at least let the baby climb out. I don’t need any more foxes around, but I think the little one should at least have a better chance at life than this. When I first saw this flower, I thought, “wild phlox!” Unfortunately, that is not the case. 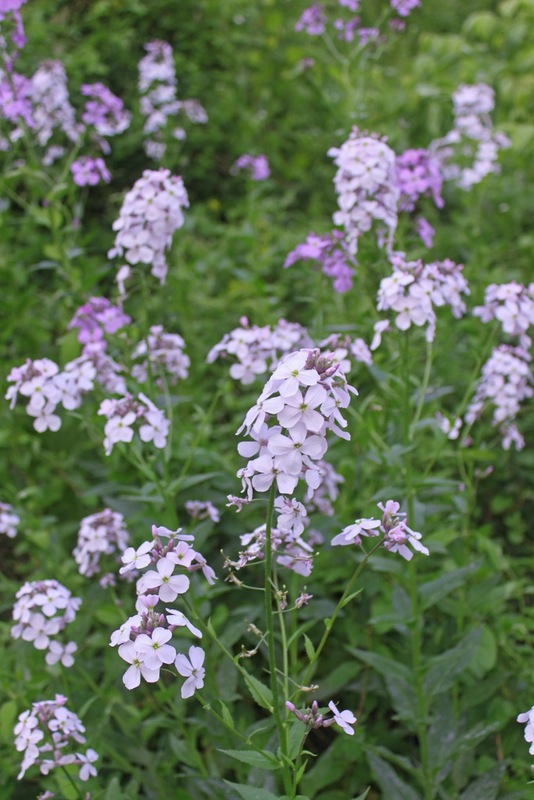 This is dame’s rocket, yet another invasive species from Europe. 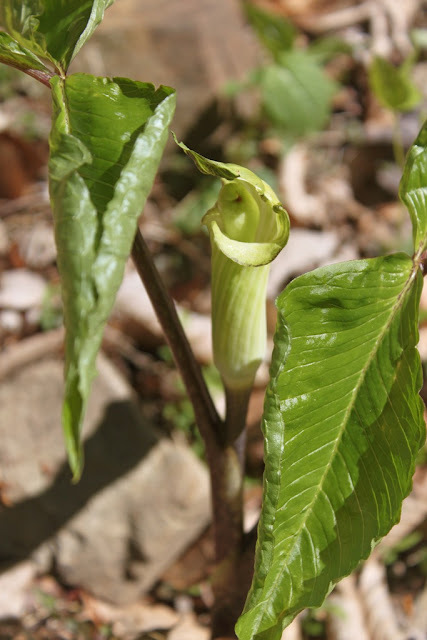 This invasive arrived in the 1600’s, and nothing I read finds much onerous to say about this showy plant. The worst that can be said for it is that it “might” push out native species. Compared with invasives like multiflora rose, that’s a pretty mild condemnation. Besides, any plant that arrived in the 1600’s is more “native” than my own family, who didn’t get to this side of the pond until the mid-1700’s. Dame’s rocket is all over the place right now, filling every roadside gutter and ditch from the bottom of Roundtop Mountain to almost the top of it. These plants don’t flower for very long. Yesterday was the first I saw them in any numbers, and they will likely be diminishing in number by next week. The flowers run the gamut of shades from almost white to mid-purple, and every shade in between. Many gardeners grow dame’s rocket in their gardens, and it easily and happily escapes those confines of civilization. And just so you know, wild phlox has five petals, not four, but until you are close enough to see that, the plants look much alike. Still, I find it discouraging at how often wildflowers here on the mountain turn out to have originated someplace else, nearly always Europe. It’s completely understandable that new immigrants would like a bit of “home” in their gardens and around their houses, but I can’t help but wonder and fantasize a bit about what this area would look like today if only native plants covered the area. Only in my dreams is that a reality. My new baby chicks are all doing well and growing up very fast. The three Rhode Island Red chicks are now a little over three weeks olds. 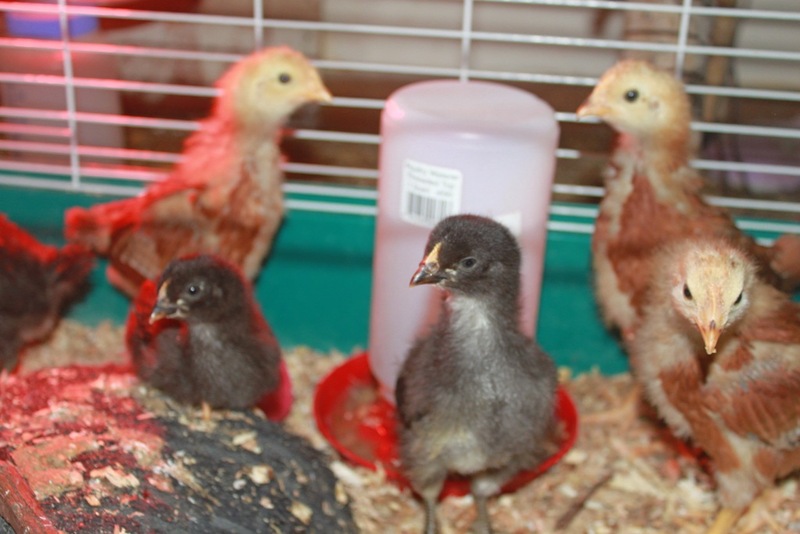 The three black sexlink chicks are just over two weeks. Within two-three days of having them, I could already tell which was the boss chicken. She is the biggest of the big Rhode Island Reds. Even at just a few days old, if she wanted to walk somewhere, she marched right over the top of any other chick in her way. She's still bossy. 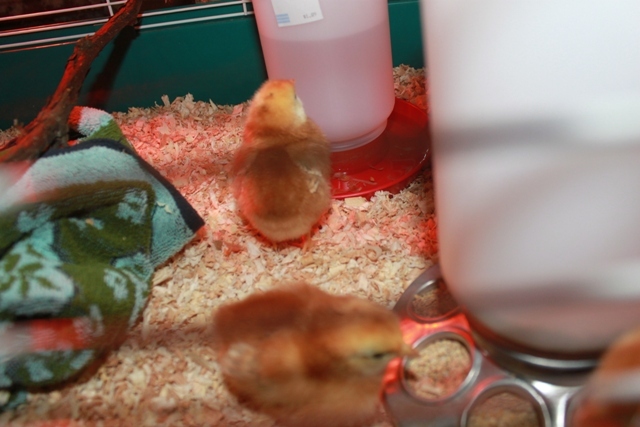 They are still under a heat lamp, of course, and will be for another two weeks or so. They won't be ready to go outside until sometime in early June. Compare the photo I took last night with one I posted the day I brought them home. There's quite a difference. Then, they were only about a third the height of their one-quart water jug, and today the reds are taller than the jug. The little ones are already getting their feathers and their tails. They are all very inquisitive and obviously a lot stronger than they were then. Though the black sexlinks are a week younger than the reds, I believe they will also be a slightly smaller chicken than the reds. I expect the reds to be large chickens and the sexlinks to be medium-sized. The sexlinks are supposed to be good, strong laying hens, so we will see how that goes. So far the babies are doing just fine! 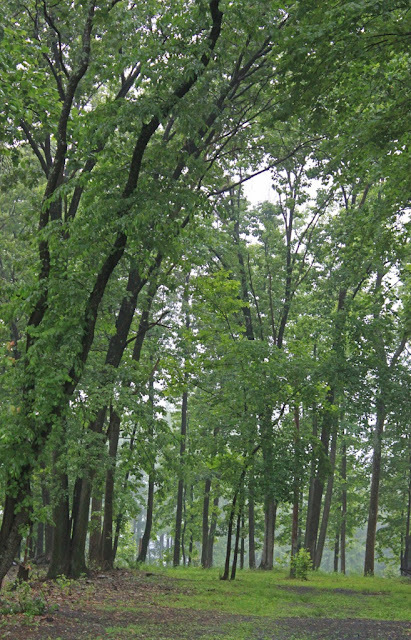 Now that I’ve returned to Roundtop, and even though I was gone just a few days, I notice the leaves are even denser. 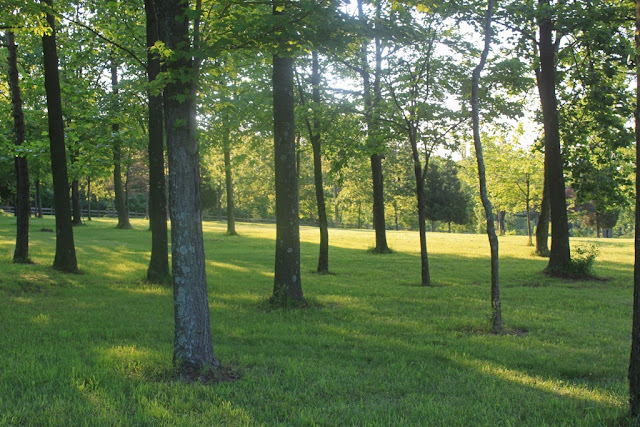 My views into the woods are feet less than they were when I left, and it is very green outside. The spring flowers are mostly over by now, and the ones that remain are fewer and look a bit lonely. The summer flowers with more brilliant colors than their spring cousins have yet to appear. The result is that the forest borders on the monochromatic this morning. Green, with a few leaning lines of brown, is the rule of the day and will be the rule for months to come. Somewhere in all that greenery invisible warblers flit from leaf to twig. 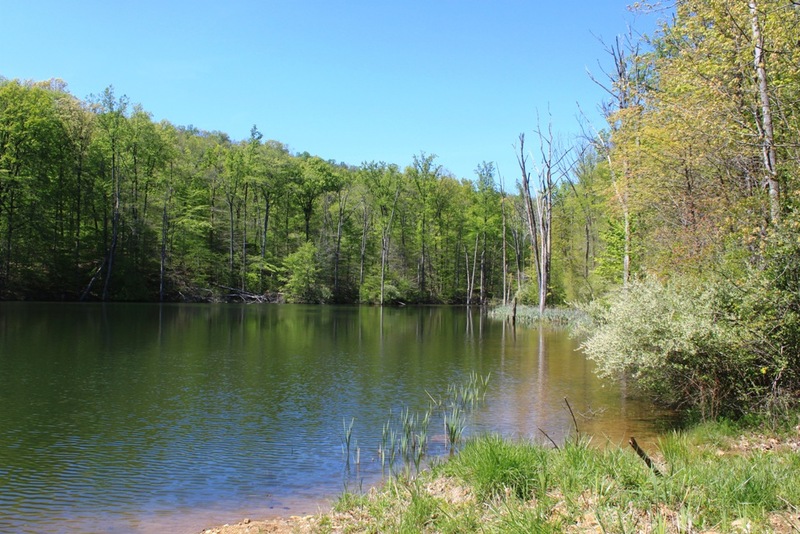 If not for the songs of wood thrush, ovenbirds and black-throated green warblers (to name a few), I would think the forest largely empty of fauna. Perhaps it is the leaves that sing, not birds. I see no birds, only leaves, all in green. 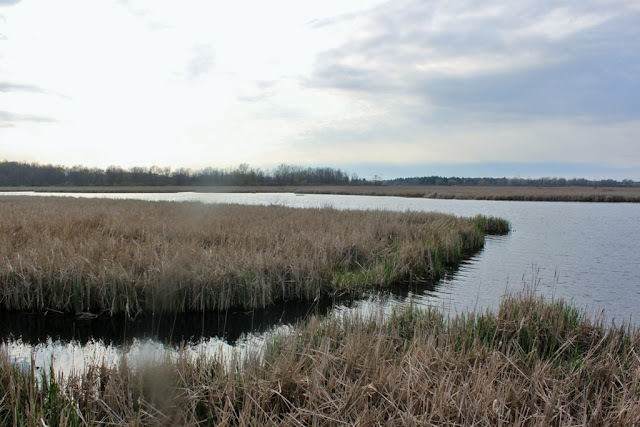 Visiting Braddock Bay near Rochester, New York, offered me a good opportunity to see birds I don’t get to see on my mountain. May is prime migration and birding season. 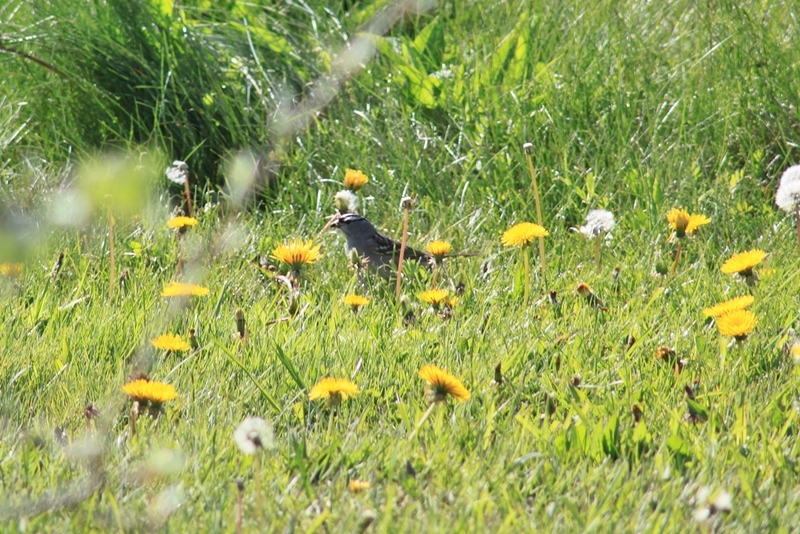 It’s hard to tear myself away from my own patch during May, but I'm glad I did as the trip turned out to be worthwhile for birding, though I didn't have nearly as much time for it as I would have liked. The area where sawgrass ends and the solid ground begins is marked by a narrow strip of vegetation, a kind of hedgerow. In this narrow band, lots of birds gathered and found cover. 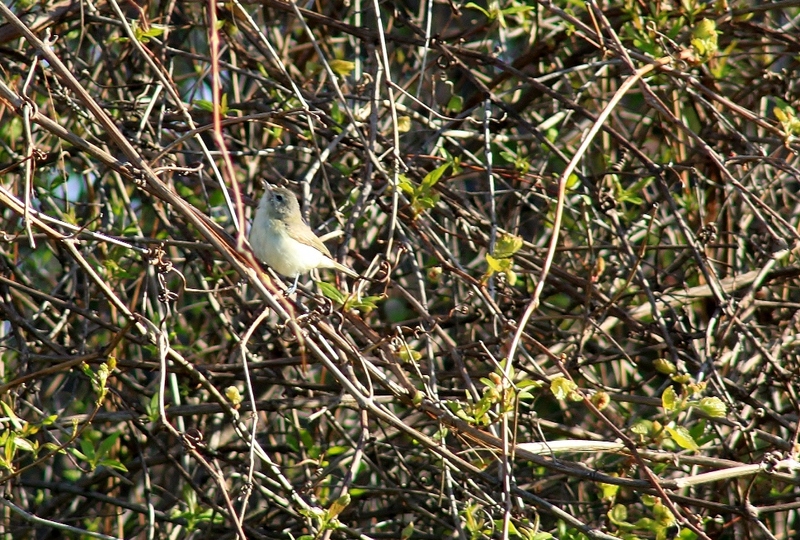 The narrowness also presents a good opportunity for birders to see birds that usually prefer to stay hidden. 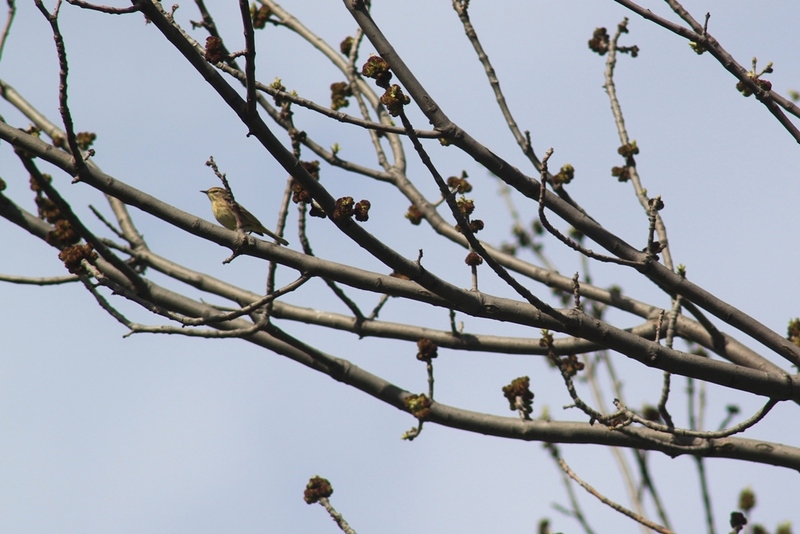 Also on hand and virtually everywhere else were palm warblers. 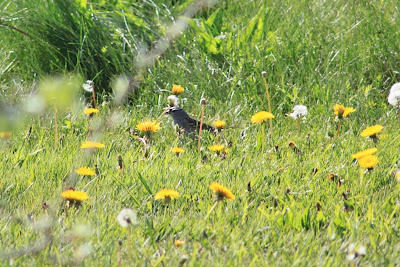 Another bird I don’t often get to see, let alone get to see well and be very cooperative, was a white-crowned sparrow that was very engrossed in those dandelions. Now that I’m home again, I need to catch up on my cabin birding! When you’re a birder, as I am, May is no time to be sitting indoors. This weekend I visited Braddock Bay Raptor Research Center along the south shore of Lake Ontario near Rochester, New York. The annual board meeting of the Hawk Migration Association of North America was held there. For the most part we were inside and not looking at birds, but we all took advantage of every break, as well as the time before and after the meetings adjourned to go outside and see what we could see. May is always the best time to look for things outside, so even the few minutes we had was very productive. The first view today is where the bay meets the land. Miniature inlets and channels were everywhere and was great habitat for a variety of species. 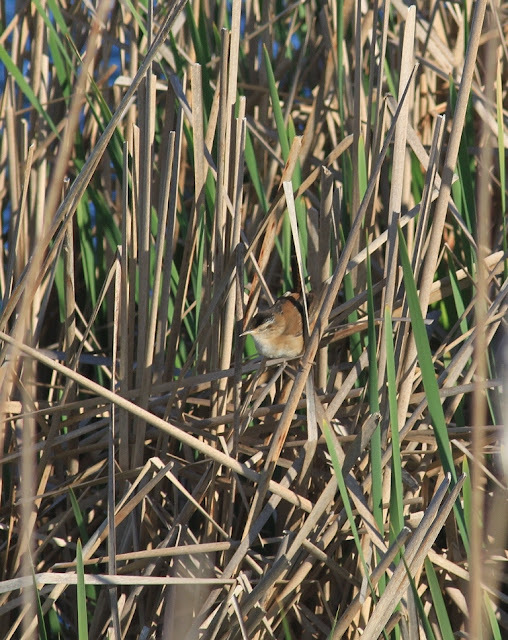 My best sighting in this part of the bay was the marsh wren. These wrens are frequently heard in appropriate habitat but not often seen. Here at Braddock Bay I heard at least three of the birds, but getting to see one took some time. And then finally, one of these little devils popped out just long enough to grab a quick photo of one. Success! Seen and photo'ed! The weekend also produced some other good sightings--palm warblers, a warbling vireo, white-crowned sparrow, third year bald eagle, sandhill crane. I'll write more about those tomorrow. It's hard to top finding half a dozen showy orchis plants in bloom during my walk on Sunday (see yesterday's post for photos). My walk was still in its early stages when I found the orchids on this day of glorious weather. The euphroria of that carried my feet further into the woods, but my mind was still on those orchids. So perhaps that's why I didn't see the red fox earlier than I did. The fox was just off the left side of the trail and was climbing over a log and rock. I stopped dead, expecting the fox to bolt. Amazingly it did not. It kept coming towards me, no more than 15 feet away for at least another 4-5 steps. Finally, it did see me and faster than I could blink it disappeared into deeper the woods. I went over to the spot where I first saw the fox, wondering if there was a den there. No den. I believe the fox was napping, though, in the sheltered area under the log that was resting atop a good-sized rock. Perhaps it heard my footsteps and got up to investigate, not realizing in those first moments that I was Right There. A few seconds later and from just across the stream, I hear the fox bark. The poor thing was probably complaining to its mate, "I had to move! I'm over here now!" That was, I think, the closest I've ever gotten to a fox in the woods. It was a beauty, too, red and plump, with no sign of the mange that I saw on foxes a year or so ago. Even though I had a camera in my hand, the whole incident happened too quickly for a photo. The only way I might have gotten a photo is if my eye blink had been a camera shutter. Jacks-in-the-pulpit (or is that jack-in-the-pulpits?) are up this week, too. 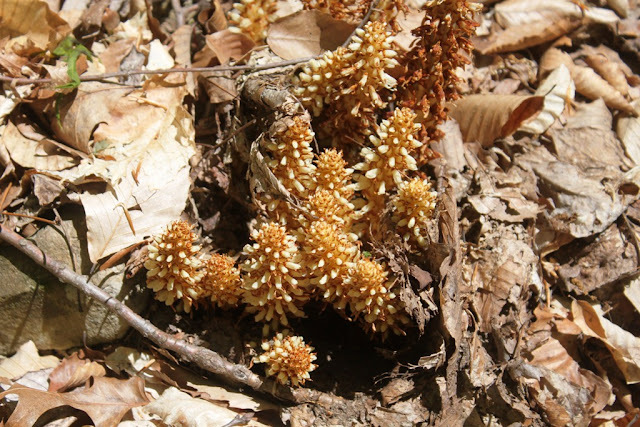 I found these odd fungus on my walk. At first I thought they were "expired morels," but photos I've seen of fading morels don't look like this, so I don't know what they are. Interesting fungus is about the best I can come up with. I'm glad I took good advantage of the superb weather to traipse down along the stream this past weekend. The rest of this week has been foggy and humid, with spates of much-needed rain and occasional thunder. The rain is appreciated, but it's not the kind of weather that makes for great photos!